My Easy Cutting-Board Guacamole is lightning-fast and absolutely delicious. 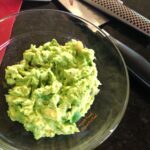 Mashing the avocado on the cutting board and folding in the ingredients gives you more control over the mashing and mixing process without making a mess. Scale this recipe up as needed to feed just a few or a crowd. I’m sure we’ve all seen the Mexican-restaurant spectacle of guacamole being made to order tableside. Except for the avocados themselves, the ingredients are all prepped in advance: after mashing the avocados (usually in an uber-cool-looking mortar-and-pestle device called a molcajete), the chef adds a bit of customer-requested this and that, salt and pepper, squeezes lime over the whole thing, and voilá. I decided to apply the same principle at home, but to make it even simpler. A molcajete is great for mashing avocados, but so is a cutting board and a fork. Less impressive? Sure. Equally effective? Absolutely. I would actually venture to say that the fork-cutting-board-combo is more effective, because without the sides of a (difficult-to-clean) heavy stone vessel or bowl getting in the way, you have much more control over the mashing and it’s very easy to fold in the additional ingredients you want. When you’re picking out your avocado, look for fruits (yes, it’s a fruit) that are dark in color rather than vibrant green. Give it a gentle squeeze: it shouldn’t be rock-hard, but it shouldn’t be mushy. There should be a little bit of give. If you’re uncertain, ask for help. Fun hack: if you want an avocado to ripen more quickly, put it in a paper bag with an apple for a day or two (check daily). The apple releases ethylene gas, which accelerates the ripening process. Using extreme caution, lay the avocado down on the cutting board and make a cut into the avocado as if you’re going to slice it in half lengthwise: stabilize the avocado with your non-dominant hand, keeping your hand above the knife and away from the blade. As you gently push down, you’ll encounter the stone near the center of the fruit. Now, you want to continue that lengthwise cut all around the fruit so that you can pull it apart. Once you’ve done this, twist the two halves of the avocado apart to reveal the stone. When you’ve freed the stone, hold your knife over the trash can or garbage bowl and use a teaspoon (or the heel of your palm) to carefully knock the avocado stone off your blade. “Avocado hand” is actually a thing, so beware—as in, some have suggested that warnings should be posted on the avocado bin. This condition occurs when people stab themselves in the palm (OUCH) while trying to dig the stone out of an avocado with a knife, or are otherwise unaware of the location of their fingers/thumb/hand in relation to said knife while trying to prep said avocado. If you’re unsure of how to proceed, simply Google “YouTube prep avocado.” Here. I’ve done it for you. Once you’ve dispensed with the dangerous part of the avocado prep (slicing in half and removing stone), all that remains to be done is to scoop the avocado flesh out of the skin and onto the cutting board using a spoon. Now you can use a large fork to mash the avocado to your preferred consistency. I like to add finely chopped tomato, onion, jalapeño, and cilantro to my Cutting-Board Guacamole. For a lightning-fast riff, I instead add pico de gallo if I happen to have some hanging out in the fridge—which I frequently do. It already has the lime juice I need, so the guac becomes a 2-minute affair! Lots of people like garlic in their guac, but I find it overpowering and a bit on the bitter side. If garlic is your preference, you can leave out the onion and add about a quarter of that amount of garlic (tread lightly!). Cutting-Board Guacamole is a thick mixture, so as long as you fold everything in quickly (especially the lime juice), you don’t have to worry about making a mess. When all of the ingredients are folded in, I use a scraper to scoop it all up from the cutting board and into a bowl—although we have been known to go for the bag of tortilla chips and eat it right off the cutting board. The cutting board technique also works great for making an avocado schmeer for toast (and no, I’m NOT going to post a recipe for avocado toast: that’s just…really?!). This Cutting-Board Guacamole recipe is per avocado: that way, it’s easy to scale up as needed. One avocado makes more than enough for me and the hubster to polish off. If you have any guac left over, squeeze a bit more lime juice over the top and cover with plastic wrap, carefully pressing the wrap down onto the surface of the guac and leaving as little room for air as possible. It’ll keep for a day or so: the browning on the top is due to oxidation, not spoilage. 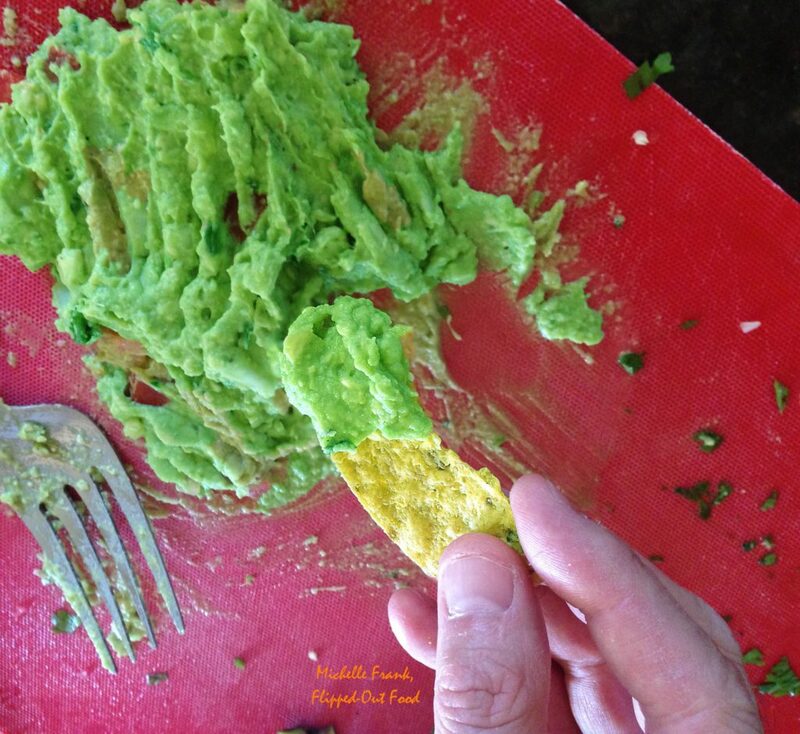 If the top of your guac has turned brown, simply scrape that part off and enjoy the rest. 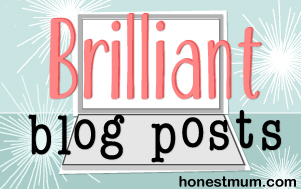 I am thrilled to link this post up with #brillblogposts on HonestMum.com! Check it out here. Cut the avocado in half lengthwise. Discard stone and scoop the avocado flesh from the skin and onto a cutting board (see instructions and warnings in the post above!). Mash the avocado flesh with a fork until you reach the consistency you like. Fold in the remaining ingredients until incorporated. Scoop guacamole into a serving bowl with a scraper, or eat it right off the cutting board. Enjoy! 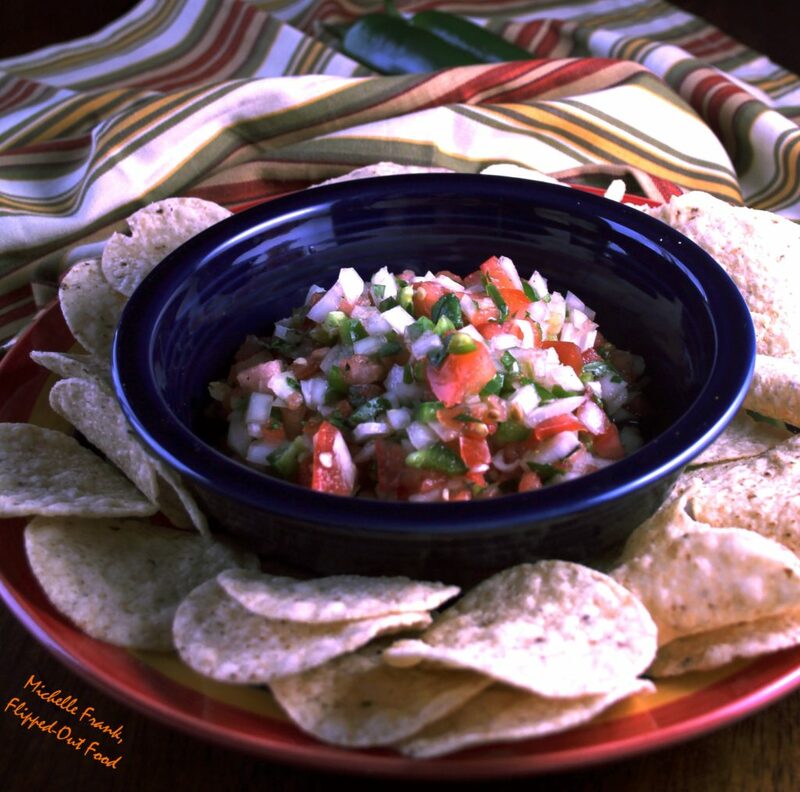 Pico de Gallo: A zippy, spicy Pico de Gallo recipe that’s perfect for football parties and potlucks. Serve alongside a bowl of sturdy tortilla chips. 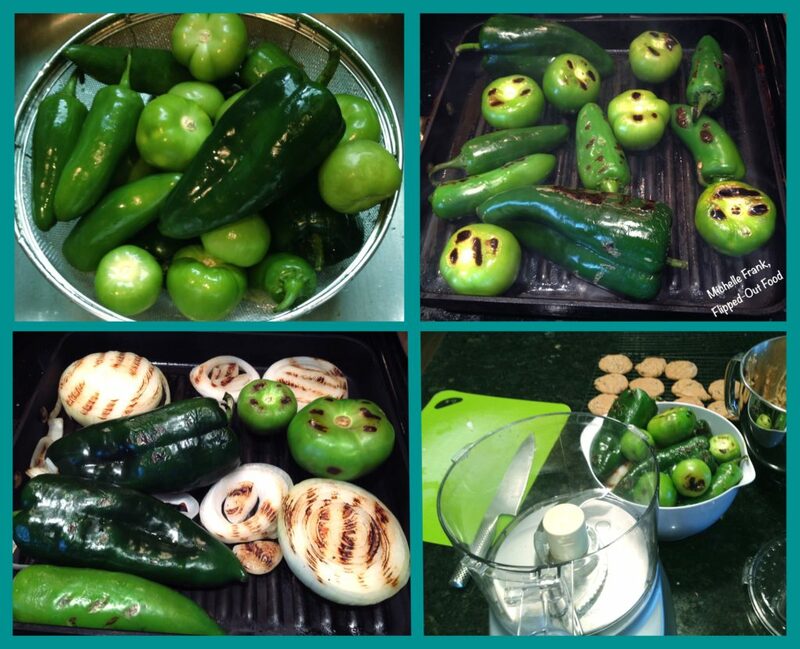 Salsa Verde: a fresh, vibrant salsa made with charred tomatillos, poblanos, jalapeños, and onions. Perfect for eating with chips, on meat, with tacos—you get the point! Fab and now need to eat guacamole! Yum. I love guacamole! And mashing it all right on the cutting board saves on dishes – who doesn’t love that? Thanks, Lexie! My hubster certainly appreciates not having to wash extra dishes! Have to say, it’s great having a guac recipe with no garlic. It’s much better that way. I tried the guac recipe with the pico de gallo riff (also your recipe) and thought it came out great. Much better than the tableside variety. Thanks, Deborah! I’m glad you loved it! Love this idea of doing it on the cutting board – and I’d never heard of “avocado hand” before! Totally makes sense though! Easy, simple and delicious. Guacamole is absolutely amazing with any dish, and l try my best to include avocados into my little one’s diet, as she doesn’t seem to like it without me hiding it in other dishes. Tortilla chips with guacamole, perfect delish snack :). I googled Avocado hand, I can’t unsee it.. Thanks, Silvia! I know what you mean—avocado hand is haunting my dreams! 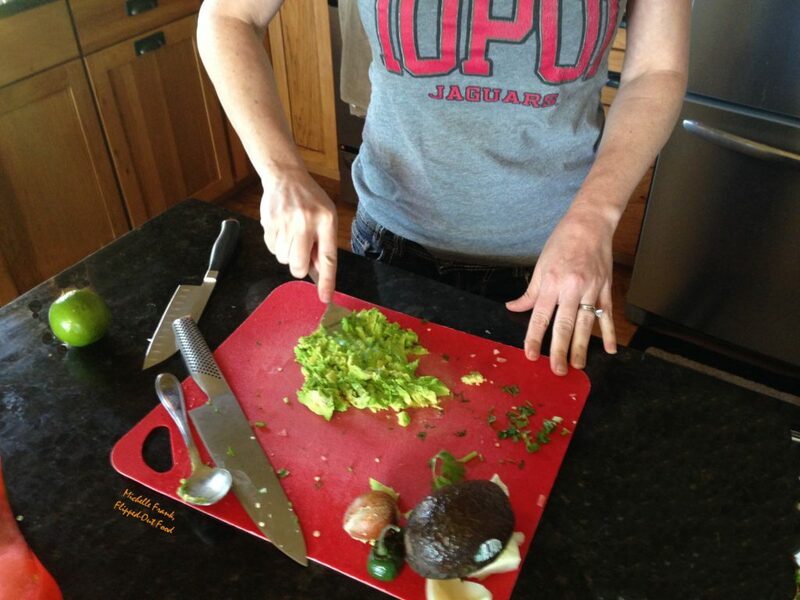 It never occurred to me that you could make guacmole on a chopping board, but it looks so easy and delicious! Thanks, Thanh! The cutting-board method is so easy that it’s the only way I make guac anymore.